Home » Video: Did an alien vessel reach the coasts of Japan in 1803? 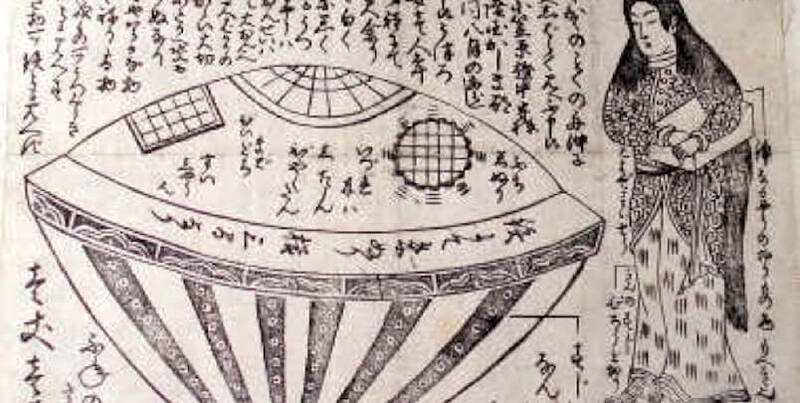 This has been more or less the question that many have asked since History Channel broadcasted a documentary about an old Japanese legend, displaying certain ancient drawings to the public that many did not hesitate to associate with an artistic depiction of a UFO. Or rather, the commonly held notions of the “rounded” shape of the unidentified object in question. The story first became known in Japan well into the 19th century through two books that were compilations of various curious events and fictional items based on the Japanese folklore of the time: the “Toen Shosetsu” and the “Ume no Chiri” published in 1825 and 1844, respectively. Both works included the same story, more or less, under the same title: “Foreign Woman in a Hollow Boat”. The story goes that on 22 February 1803, the residents of a Japanese village (Modern Ibaragi) saw a strange vessel floating in the sea and slowly approaching the shore. When some fishermen set out on their craft to meet it, and then towed to the beach, they found within it a young woman – some 20 years old – of unusual physiognomy, with pink skin and long red hair, who spoke to them in an unknown language as she clung to a wooden box. An object of considerable importance to her, it seemed, as she would allow no one to touch it. The craft, also unknown to the locals, was round and rather small, measuring some 5.5 meters across and some 3 meters tall. Its upper section was black and had colored glass windows covered with grating, forming four windows whose edges were protected by some sort of tar. The lower part was reinforced with iron sheets and its interior was covered in handwriting the natives couldn’t recognize. There was a soft rug and food and water for the strange lady. By César Reyes de Roa (c)2009 This, then, is what the aforementioned texts say on the matter. The image depicted above shows an old illustration from those same texts, which, according to some, represent the spacecraft, found adrift by the uninformed Japanese witnesses in 1803. In Context Utsuro Bune (or Utsuro Fune) literally means ‘hollow boat’ in Japanese – not a bad description to convey what the villagers saw floating toward them, a small vessel like a rice bowl. but was it really the “strange craft” in of itself, or the young red-haired foreigner that caused a sensation worthy of inclusion in the compilations of oddities at the time? True or not, the fact is that the story told in the 1825 and 1844 Japanese books corresponds to the Tokugawa period (1603-1867) when Japan was isolated from the rest of the world, living in a wholly feudal society (the shogunate) and avoiding all foreign influences. especially western. It isn’t surprising then that the presence of “someone who came from afar” (a foreigner) would be cause for conversation…whether for or against Japanese isolationism. Some very likely interpretations about the red-haired woman’s identity. have been put forth, and perhaps those who suggest paying attention be given to ancient Russian customs — dealing with unfaithful wives – are correct. The harsh law unwritten law mandated decapitation for the male, his head placed in a box that was later given to the woman, who was then expelled from the community by placing her aboard a small boat, towed out to sea, and then abandoned to her fate. The proximity between Russia and Japan fosters this hypothesis. Much better, of course, than any passing idea that suggests relating the red-haired woman in the “hollow boat” with visitors from another world. Moreover, what is there in the vessel’s description that leads to any connection between the advanced technologies that one would suppose of a UFO, if these indeed come from distant worlds? Nothing. Nothing at all.